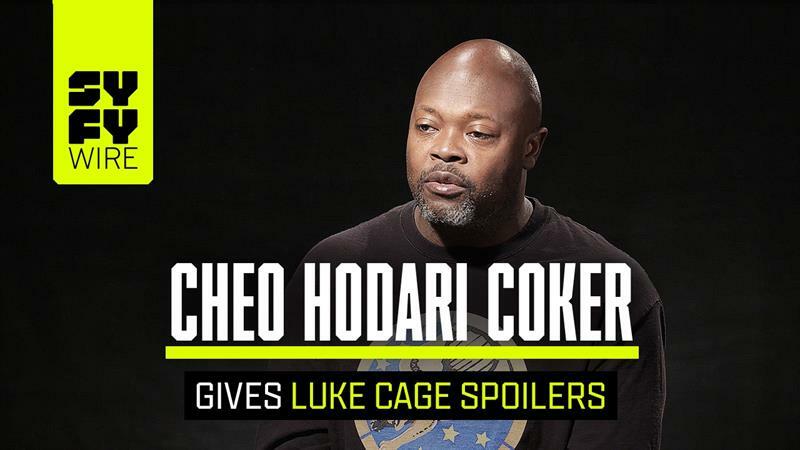 Luke Cage showrunner Cheo Hodari Coker is a huge Barack Obama fan; so much so that you'll notice in the background of Pop's Barber Shop — Luke's home base in Marvel's Netflix show, which dropped June 22 — that Obama and Joe Biden have both made the free haircut list. America is a very different place since the first season of Luke Cage premiered on Netflix in September 2016. Donald Trump is now president of the United States, presiding over a nation that's even more deeply divided over politics, race and most recently, immigration. Black Panther premiered in theaters last February, building off and blowing wide open the momentum of black pride in comics and entertainment started by Coker's Luke Cage Season 1 premiere. And the #MeToo movement is in full swing, creating very open and difficult conversations about sexual harassment and abuse to women. Luke Cage's second season addresses all of these issues, directly and indirectly. And if you think Black Panther explored what it means to be black, Luke Cage's second season takes that and amps it up to whole new levels. Talking with Coker on the phone, he likened it to Stevie Wonder's Songs in the Key of Life or Michael Jackson's Thriller or Miles Davis' Kind of Blue, albums that are entrenched in the black experience but ones that everyone listens to. Case in point: Bushmaster is this season's big baddie. He's from the Caribbean. He and members of his family come to Harlem to take down Mariah Dillard, or as he refers to her, Mariah Stokes. The two families, the Stokes and the McIvers, have a longstanding feud that boils over as Mariah finally embraces her family heritage of crime and dysfunction, shedding her councilwoman ruse and taking over as the Stokes family crime boss after murdering her cousin Cottonmouth in the first season. Bushmaster, though, is having none of it, as he lays claim as the rightful heir of Harlem's Paradise, the music club that's been at the heart of the Stokes family's illegal operations and the family dispute. "The whole political argument that Mariah is having with Bushmaster over the history of the club mirrors the conflict between W.B. DuBois and Marcus Garvey," says Coker. "It mirrors the tension that has always existed between the African American post-traumatic stress interpretation of life after slavery and the Caribbean American perspective that is similar to Bushmaster's. It's like these two different interpretations of the immigration story; one flight to immigrate from the Deep South to the promised land of the north and the other, to immigrate to this country from Jamaica to New York." And in the middle is Luke Cage, who is going through his own problems. Not only is he forced to confront his father — wonderfully played by Reg E. Cathey in his final role before his death — with whom he's had a falling out, but he's also struggling with the price of power and fame and how to deal with it in a healthy way. At the beginning of Season 2, Coker seems to have modeled Luke very much an Obama-type person. He's well-liked and popular, seen as Harlem's Hero, a savior to the neighborhood and a man of the people. But by season's end, we see Luke begin to go to the dark side. He rejects both Claire and Misty Knight and, instead of burning Harlem's Paradise to the ground, as he says he's going to do after Mariah left it for him in her will, he sets up shop there and begins to let the power of corruption that the club symbolizes take over. If you're likening that transition to the political transition America has been going through since Trump has taken office, you're not wrong. Coker and his team directly quotes Trump in the show in the last episode as Luke tells D.W., his biggest fanboy, "I'm the only person who can make Harlem great again." "On one hand, we don't hide our political leanings, but I feel that as a show, you have to kind of be more subtle in terms of where things go and our perspective of things," says Coker. "It's one thing to talk about policy and another thing to show what happens with policy... to build a world with people's legislation that has actual effects on real people. It's very much a genre of fun television that, at the same time, deals with what's real." This season also sees Misty getting into full comic-book mode as she gets her bionic arm, courtesy of Rand Enterprises. She spends the first part of the season grappling with the loss of her limb and what that means for her as a cop. But then gets a boost in confidence and direction thanks to Colleen Wing, in a kickass bar fight scene that teases a possible future team-up as the Daughters of the Dragon from Iron Fist comics lore. Speaking of Iron Fist, Danny Rand makes an appearance as well, teaming up with Luke, not only to bust up some bad guys but to offer Luke some life lessons. The chemistry these two characters have and their action sequence in Episode 10 makes Danny's Iron Fist a much more likable character, which was something Coker was very aware of. "I think it's probably going to take the heat off of that first season of that show [Iron Fist] because we kind of show, like the comic books, how they really work well together." I, of course, asked Coker if there's a chance we'd see a Daughters of the Dragon or a Power Man and Iron Fist spinoff. "Marvel allows us to use these characters in our show because that was the whole point, is interlinking Marvel shows," he says. "And then when you see when it's successful, it sparks internal conversations of what it could be... but I'm not in control of that happening..."
And then there's Tilda — otherwise known as Nightshade in the comics — who, as it turns out, is becoming a lot more like her mother than she wanted, what with murdering her and all in prison, using a mystical concoction she whipped up in her apothecary. Coker and company took a lot of liberties when it came to Tilda's character, as well as with the entire Stokes family. In the comics, Coker says, Tilda is never related to Mariah. Uncle Pete, who raped Mariah when she was younger and is revealed to be Tilda's real father, doesn't exist in the comics. The whole Stokes backstory is a product of Coker and his team's imagination. But it very much works for the show. And it makes Mariah's darker deeds, like mass murder and burning Bushmaster's uncle alive and then shooting him in the head because he wasn't dying quickly enough, seem... not at all relatable but, at least, understandable. On the opposite end of the spectrum, there's Shades, who arguably becomes Mariah's full-fledged partner-in-crime. After seeing just how far Mariah is willing to go to defend her family name against Bushmaster, he decides he's had enough and helps Misty bring in Mariah once and for all. But it's his relationship with his lifelong best friend Comanche that ends up being one of the most surprising and poignant in the season. "The things was, they were always best friends from the street. Once they were in prison, things took a more romantic turn," says Coker. "Human sexuality is not always about being labeled. It's about having a human moment, an emotion… and what that whole speech was about in Aida's [Aïda Mashaka Croal] bold, beautiful, script was that in prison, when there's so many extremes of power and of violence and of being put in this relationship with all these different limits, things happen. And the difference was that from Shades' perspective that was back there. "From Commanche's perspective, he wasn't afraid to basically say what he felt," Coker adds. "The interesting thing is when you get to that twist, when Shades ends up killing Comanche, he doesn't kill him because of any lingering snippets of homophobia...we're very careful about that. We're very careful in making sure that when you have that pivotal moment, when Shades take Comanche out, it's not because he's afraid of anybody finding out about them or that he's not proud of what they shared or what their relationship is. It literally comes from the standpoint of because 'I love you, I was blind to what you were doing and I can't have that around.'" If Season 2 tells us anything, it's that in Trump's America, as Coker says about Luke's potential future as a crime boss, "absolute power corrupts absolutely." Coker says that if they are lucky enough to have a third season, it'll be interesting to explore that and see some of the things that Luke could possibly get into.